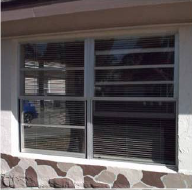 This older home had the original unpainted factory aluminum windows that were very typical of Florida construction 20 to 30 years ago (Before). 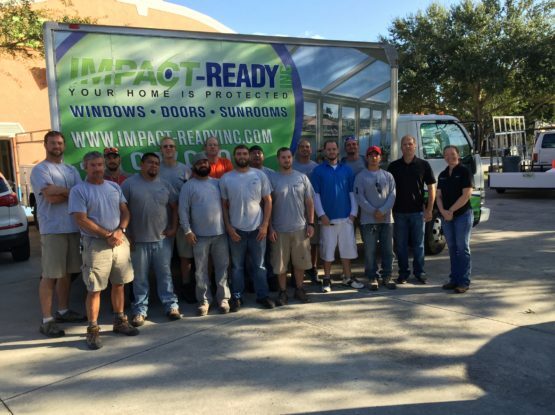 Impact-Ready, Inc. removed these outdated, inefficient and leaky windows and replaced them with Custom Windows vinyl framed insulated impact windows with the Energy Star rated Low E3 366 coating. Ok, so why is a vinyl framed insulated impact window so much better than the aluminum framed impact window of Old? 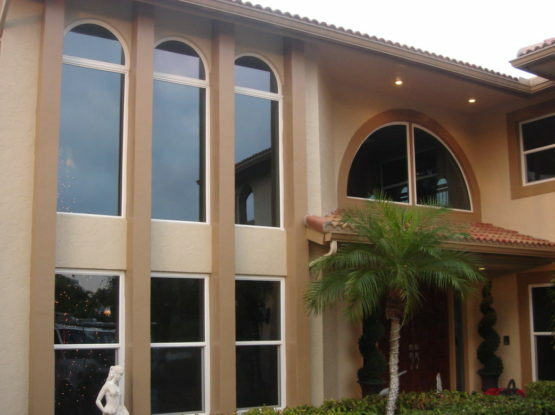 The main reason is that it gives you 8 means of protecting your home from hurricane projectiles, hurricane wind pressure, heat and water intrusion. The first means of protection is the 3 inch thick honeycomb extruded vinyl frame. The vinyl itself is long lasting and is impervious to the harsh Florida environment. No maintenance is required down the line. The honeycomb design also provides 16 insulating compartments all around the frame. 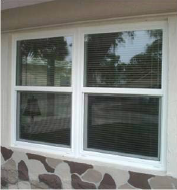 (more than any other window made) As compared to original construction window frames that are just over 1 inch thick, the vinyl frames provide a lot more rigidity and more material to interface with the opening in the building. We also fasten the window to the building with more fasteners that are many times larger than the original installation. The second is the outside sacrificial glass layer. If the window should get hit with a projectile during a wind event, this glass will break, and the resulting fragments will remain outside and not on the carpet and furniture in your home. Argon gas which is the fourth means of protection. The fifth is the desiccant material which is located in the metal frame. (See the cross section drawing). If moisture should somehow infiltrate the insulated glass assembly, perforations in the metal spacer. 7. 8. The sixth, seventh, and eighth layers of protection comprise the impact glass sandwich. 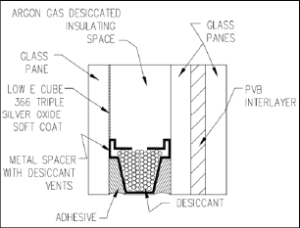 The center layer in the sandwich is the PVB or SGP polymer material which is the working material that prevents projectiles from penetrating the home. Why is the Custom Replacement Impact Windows Sacrificial Layer on the Outside? Secondly, after a window is hit with a projectile, the sacrificial layer shatters. The laminated layer still has to hold on to the window frame to prevent the projectile, wind and water from penetrating through the opening. If the laminated layer is on the inside, it will have more surface adhesion to hold onto the window frame and protect the home. The adhesion is provided by the glass mounting “back bedding” which is either cold based urethane or hot based silicone depending on the design and size of the glass. The home now has the greatest protection possible. If the laminated glass is on the outside – as with some competitor’s windows, and the glass has been hit causing deflection and the shattering of the inside glass, the only thing holding the laminated glass to the frame is the light gauge aluminum air space framing. There is no longer any adhesive holding on to the glass as is the case with a Custom Window. There is a much lower level of penetration protection. Remember, if a window has been hit, it does not mean that the storm is over. The window assembly still has to withstand hours and even days of pounding from wind pressures. Bottom line – laminated glass as the inside layer gives much better overall mechanical protection than laminated glass as the outside layer. Where should the Low E Soft Coat Layer be on my Replacement Impact Windows? 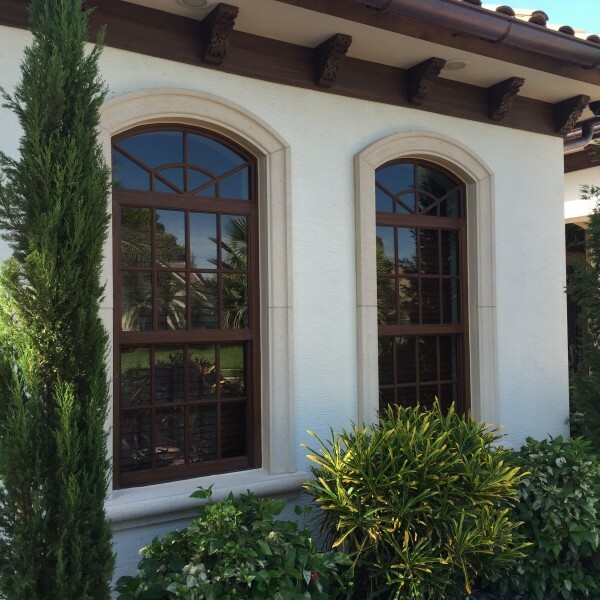 Interested in learning more about the protection and energy efficiency that replacement impact windows can offer you? Contact us today for a no-pressure consultation!